NICOBAND is a universal self-adhesive sealing tape. 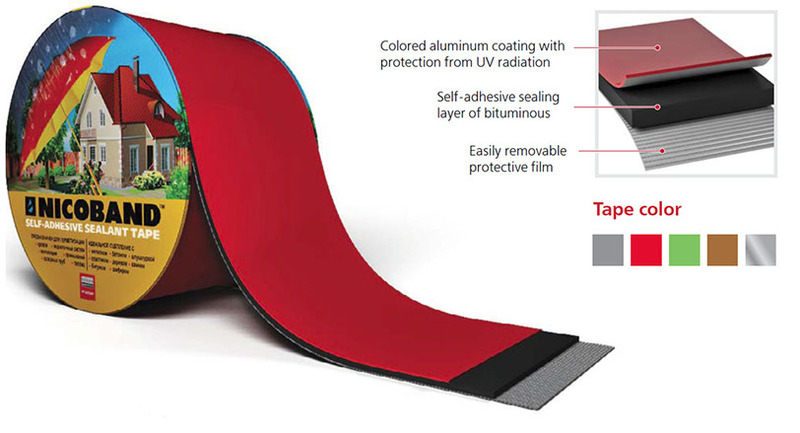 It is produced by placing a color reinforced aluminum covering on a waterproofself-adhesive bitumen layer. The protective film on the adhesive bitumen layer is easy to remove. The material is easy and convenient to use, and it bonds ideally to concrete, gypsum, metal, bitumen, stone, wood and other surfaces. The sealing tape is designed for sealing seams and joints, repairing cracks, waterproofing, and corrosion protection. The surface must be clean, dry, and free from rust and dust. For a better and more durable bond a priming of the base is recommended. The surface and material temperature must be at least +5 °C. At lower temperatures it is necessary to heat the adhesive side of the material and the base.